Following Hurricane Maria one year ago, officials of the Dominica Police Force released the names of people who died and those who were missing due to Hurricane Maria. The list revealed the staggering impact of the hurricane on human life on the island: 31 people were confirmed dead and 34 missing. Pointe Michel and Loubiere were the hardest hit in terms of human casualties. According to information from the police, four were confirmed dead in Pointe Michel and 13 were missing. They also confirmed that on October 23, 2017 two skulls and skeletal remains were discovered in Pointe Michel at the home where Darry Grove, Nashon Attidore, Randolph Charles and Phillipson Renault were reported to have been residing during the storm. They also reported that on October 30, 2017 in Pointe Michel, skeletal remains believed to be that of Edith Fontaine was recovered. Confirmed dead in Pointe Michel were Royston Toussaint, Murray Delmore, Veronica Peltier and Glen Alexander. 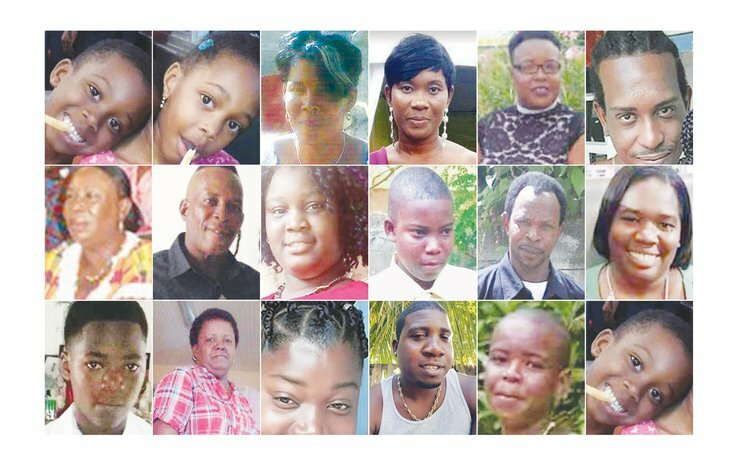 Missing from Pointe Michel were Randolph Randy Charles, Philipson Renault, Ann Lanquedoc, Morian Landor, Nadora Williams, Garvin Francis, Jerome Daniel, Jayalia Lawrence, Gertain Daniel, Edith Fontaine, Nashon Attidore, Darry Grove of Vielle case and Joanne Francis. Four were confirmed dead from Grand Bay. They were Evette Leatham, Okan Letang and Jennifer Bonny. Alpheus Maxim is missing. From the village of Dos Dane, Alfred Magloire, Jennifer Moulon and Anthony Bannis (aka Rasta) were confirmed dead while missing were Rita Magloire and Vitus of Paix Bouche. In Loubiere, confirmed dead were 10-year-old Yakira Joseph and missing were Destiny Joseph, Ivon Prevost, Myrtle Celaire, Clive Leblanc, Jerry Lafleur, Annie Simon and Ronnie Jolly of Petite Savanne. In Fond Baron, Gloria Elie Prosper were confirmed dead and one-year-old Jaydon Jno Baptiste was missing. In the village of Mahaut, Alicious Joseph and Lee alias Dig are dead. In Castle Bruce, Laronde Roberts of Mahaut and Alexis Laville of Penville have died. Also confirmed dead were: Peter Registe of Tarish Pit; Emmanuel Joseph of Fond Cole; Damina Ishmael of Stockfarm; John Thomas and Ivon Jules of Morne Bruce; Irella Henry of Marigot; Janet Canoville of Belles (living in Grand Fond); Theresa Frederick of Dublanc; Lucy Thomas of Scottshead; Whitfield Wallace of Woodfordhill. Confirmed missing in Roseau are Minelle Monetto, Jeffrey Menero, Edmond Charles, Sharon Francis and Jno Lewis Fontaine. Also missing are: Peter Lewis (Canefield); Vanya Woodman (Bath Estate); Marcus Boyd (Castle Comfort); Jopha Christopher (six-year-old in Pottersville); Christine Thomas (Savanne Paille). Police said the bodies of five people could not be identified.